^ McCausland, Jim (20 September 2009). "Rediscover ferns". Sunset.com. Retrieved 7 September 2013. ^ "Pteridopsida: Fossil Record". University of California Museum of Paleontology. Retrieved 11 March 2014. ^ "Fern Fronds". Basic Biology. Retrieved 6 December 2014. ^ a b c d Grewe, Felix; et al. (2013). "Complete plastid genomes from Ophioglossum californicum, Psilotum nudum, and Equisetum hyemale reveal an ancestral land plant genome structure and resolve the position of Equisetales among monilophytes". BMC Evolutionary Biology. 13 (1): 1–16. doi:10.1186/1471-2148-13-8. ISSN 1471-2148. PMC 3553075. PMID 23311954. Retrieved 21 May 2013. ^ Karol, Kenneth G; et al. (2010). "Complete plastome sequences of Equisetum arvense and Isoetes flaccida: implications for phylogeny and plastid genome evolution of early land plant lineages". BMC Evolutionary Biology. 10 (1): 321–336. doi:10.1186/1471-2148-10-321. ISSN 1471-2148. PMC 3087542. PMID 20969798. Retrieved 21 May 2013. ^ Walker, Matt (19 February 2010). "A mouse that eats ferns like a dinosaur". BBC Earth News. Retrieved 20 February 2010. ^ Boyd, Peter D. A. (2 January 2002). 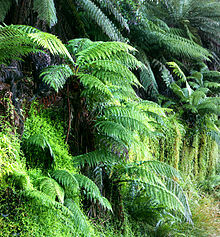 "Pteridomania - the Victorian passion for ferns". Revised: web version. Antique Collecting 28, 6, 9–12. Retrieved 2 October 2007. ^ "Traditional Finnish Midsummer celebration". Saunalahti.fi. Retrieved 7 September 2013.